I'll have to try this. I have a serger, but unfortunately I don't know how to use it yet :( so zig zag works for me. Ooooh! I'm gonna have to try this! Wow, I never thought about that, but taht is so smart! Thank you for sharing! Jantine said it for me…WOW!!!! I can’t wait to try it. I have been hand basting, but the zig zag sounds a lot quicker and a lot better. Wow. This is an awesome idea, can't believe this is the first I've heard of it, it makes perfect sense! Thanks for sharing! that's a fabulous idea! Thanks for sharing! Oh my gosh! What a simple idea, but I never thought of doing it! I'm about to quilt then bind a quilt in the next week or so and I'm definitely going to do this! Thanks for the hint!! I'm def. going to try this! Great idea! I'm definitely trying it. 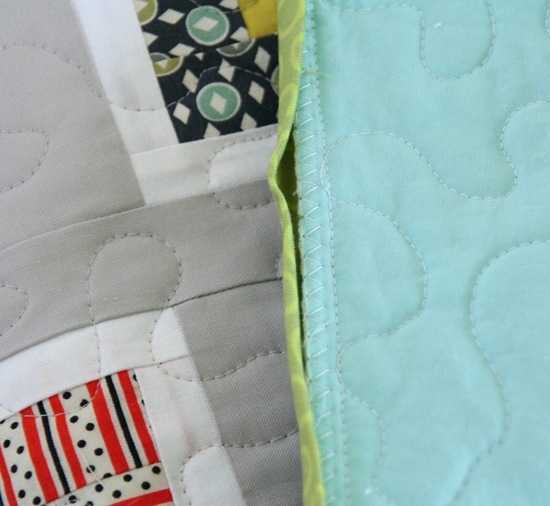 Your quilting stitches look really nice, too. Fantastic tip! Thanks for sharing. I also serge my quilt edges before binding. It really keeps the binding neat and tidy. I'll definitely have to try that!! Wow, what a great tip, I'm going to be doing that from on! I caught that same thing in the last post and thought to myself, "boy, I learn something new each day." Thanks for the details–very helpful. I've been having some problems with fraying after I wash the quilt and have been considering starting to serge my quilt edges too. It's good to know other people do it. Brilliant! I don't know why it never occurred to me to do it in the first place! This is a great idea. What size do you cut your binding? Hi, this is a very nice idea. I always have problems with my fabric edge. Doing binding with frail edge is quite a challenge. So your idea to make zig zag sew is just fit in with what I'm looking for. Thanks a lot!